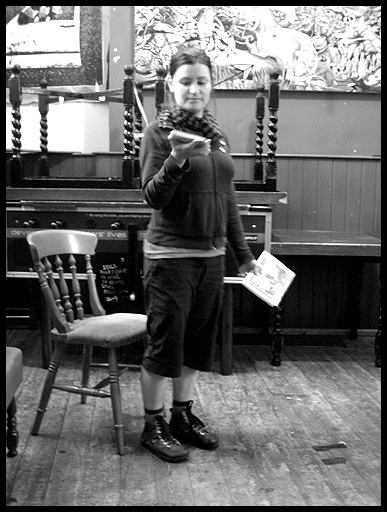 On Tuesday night we had our first ZIne Night at the Cowley Club. Hopefully it’s going to be a monthly event. The first one was small and quiet, because we didn’t have time to organise much, but it’s better to build ourselves up, than try to promise the world from the outset. We had a table with zines from attendees for swapping or selling, a cake, and a bar, and readings. First we had Alex, talking about Stolen Sharpie Revolution, and doing some zine readings, one about returning to Salt Lake City after many years, and the “don’t you have a man at home to shave for?” awkward drinks story. Then we had Wes, who kindly came down specially for the event. He read a story about cuckoos, which he is using as his entry for the Glastonbury Bard competition. If he wins, he gets a fancy chair and everything. After that, my camera battery ran out. 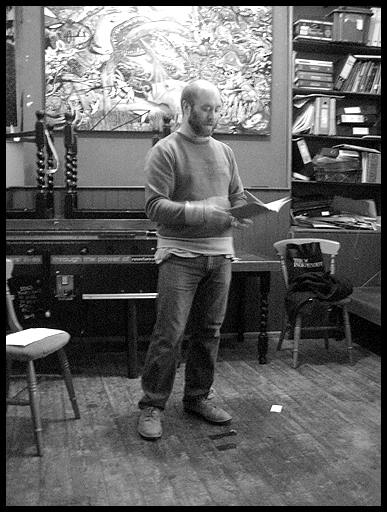 Then we had me & Toby reading some bits (we had press-ganged ourselves to fill up the lineup) and Robb gave a talk about his zine library, and how it managed to survive through Hurricane Katrina. Then we had vegetarian Mexican food, which of course bore no relation to what the americans were expecting, but was tasty, and the cafe has the nicest man in the world working there.